Depending on a commercial company for our giving infrastructure is problematic in several ways. 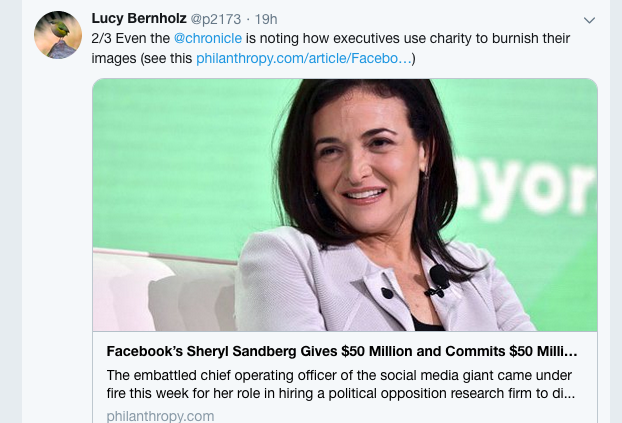 First, at any point in time the company (and this company has done this repeatedly) can change it's commitment, algorithm, priorities and leave everyone who was using it without recourse. Second, we have no way of knowing that the company's algorithms are offering all the choices to all the people. How would you even know if your nonprofit or fundraising campaign wasn't being shown to those you were trying to reach? Third, Facebook owns this data and can tell us whatever they want about it. Maybe $1 billion was given, maybe it was more, maybe it was less - how would we know? There's an existing infrastructure for measuring giving in the U.S. and a number of research centers that analyze and report on those trends every year. That infrastructure - from 990 tax forms to The Foundation Center, Guidestar, the Urban Institute, and independent research from Giving Institute or the Lilly School at Indiana U - was built for the purpose of public accountability, to protect the democratic values of free association and expression, and for industry-wide performance improvement. This infrastructure is not perfect. But the data they use and their analytic methods can be checked by others - they can be replicated and verified following the basic tenets of sound scientific practice and good evidence practices for policymaking. 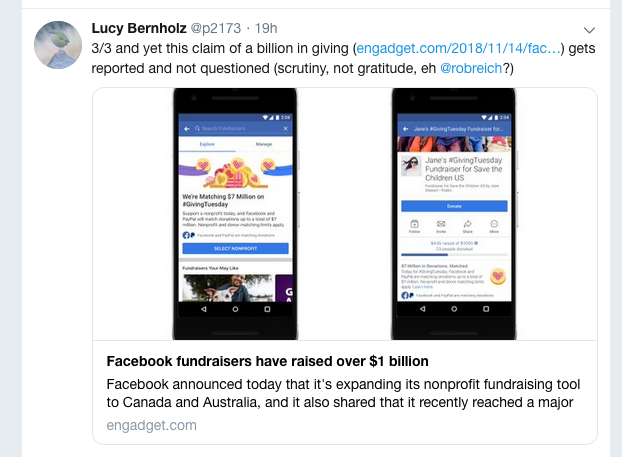 There needs to be new ways to understand what's happening on these proprietary platforms - especially if Facebook is moving $1 billion and GoFundMe $5 billion. Those are big numbers about our nonprofit sector. We need to be able to interpret these data, not just reflexively believe what the companies announce.